Members of the TARA Foundation with (r to l) Neko Meicholas, Antonius Roberts, Patricia Glinton-Meicholas, Livingston Hepburn, Claire Hepburn and Emile Hunt (left). Members of the INDABA Project with Patricia Glinton-Meicholas (centre), Ean Maura and Faith Butler Cleare (right). Patricia Glinton-Meicholas and Neko Meicholas of Guanima Press Ltd gift copies of their new book Lusca and Other Fantastic Tales to youth members and leaders of the TARA Foundation and the INDABA project. The event was held at Hillside House on Saturday, 6 January 2108. During the event members of the TARA Foundation performed several pieces of Mrs Meicholas’ work. Students of the TARA Xavier Hepburn Foundation take a bow after performing Patricia Glinton-Meicholas' work "The Importance of Christmas Dinner" and "The Boy, The Magic Drum and the Dancing Witch". (Right) Claire Hepburn, Co-Founder the TARA Xavier Hepburn Foundation. “We are so very very grateful to master artist Antonius Roberts for providing us with this wonderful space,” said Neko Meicholas. The Meicholas’ thanked the sponsors of their Guanima Press Books for Students project: the Charitable Arts Foundation (of which Antonius Roberts is a member); Barbara Thompson; Orry J. Sands; Earla Bethel of Danbrad Ltd; the Cable Bahamas Cares Foundation; Sir Franklyn and Lady Wilson; Dawn Davies and those others who have chosen to remain anonymous. 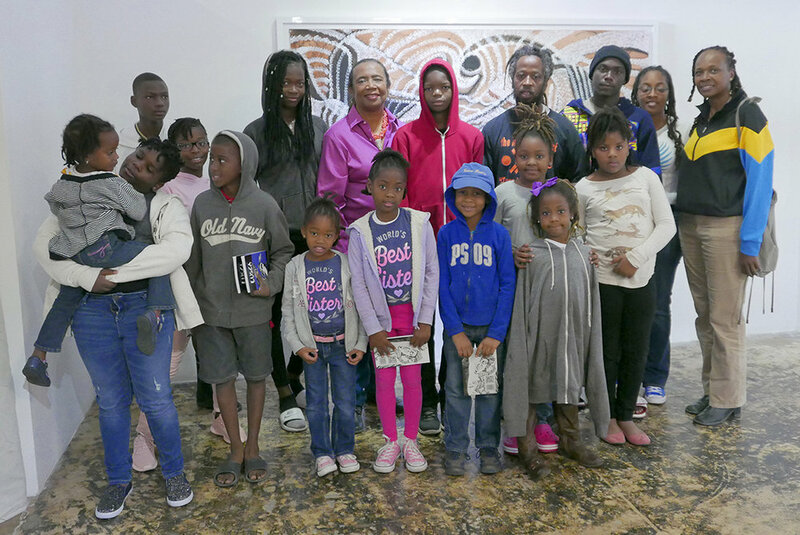 The Guanima Press Books for Students (GPBS) project aims to put copies of Patricia Glinton-Meicholas’ newest book Lusca and Other Fantastic Tales, for free, in the hands of thousands of Bahamian students in New Providence and the Family Islands. “My wife and I want to encourage young Bahamians to read more as an avenue to greater personal development and enjoyment. We want them to know how vital it is to spend all their life reading, learning, gathering information and knowledge from books and other sources,” say Mr Meicholas, whose brainchild GPBS is.